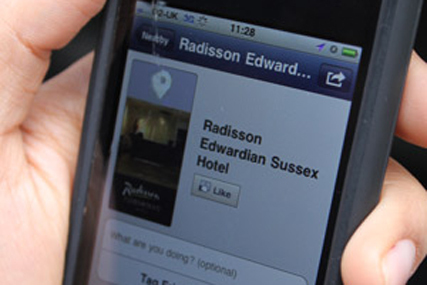 Radisson Edwardian, the hotel group, has partnered with Foursquare and Facebook to launch a digital programme for consumers to extend their check-out time through a location-based digital scheme. The scheme, created by digital agency I Spy, is called "Check-in, check out later" and allows consumers to check out of their hotel room two hours after the normal time. Consumers can check-in to one of 12 Radisson Edwardian hotels in Manchester and London through Facebook Places and Foursquare. Once registered, customers can extend their check-out time at the hotel by showing their smartphone at the hotel reception. The scheme will be promoted through social media across Twitter, Facebook and the Radisson Edwardian blog. The scheme runs from today until 31 July. Amy Clarke, ecommerce manager, Radisson Edwardian, said: "We’re constantly looking for ways to enrich the hotel experience for our guests and this was a great opportunity to once again connect an online interaction with an offline benefit. "Checking in on Facebook or Foursquare has been popular with our guests, so rewarding them with a couple of extra hours in bed seemed like a nice way to say thanks." In April Radisson Edwardian introduced Quick Response (QR) codes to its restaurant menus that linked people to an online video of a chef preparing a featured dish.